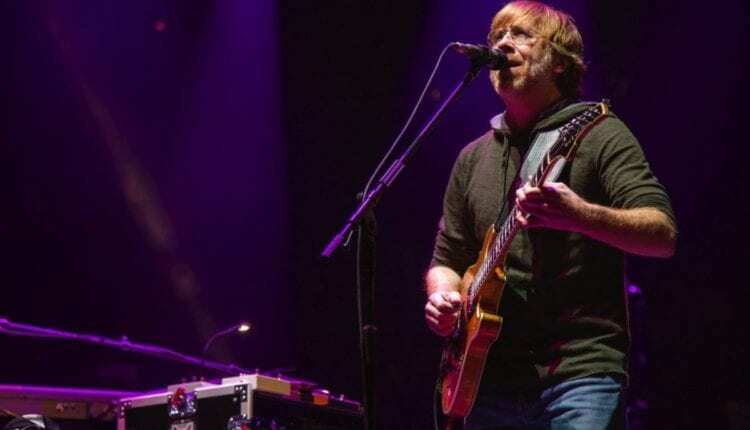 The members of Phish returned to Madison Square Garden for an unprecedented 15th time in 2017 on Friday night, and while the first set showcased a few stumbles along the way, the band showed it’s still pushing brand new boundaries heading into its 35th year. “I Always Wanted It This Way,” keyboardist Page McConnell’s tune, stretched out from 1980s-like quirkiness into a vast yet quite dark jam. “Martian Monster” and “Heavy Things” saw the band have a little fun, notably the interplay between Anastasio and McConnell in the latter. “Destiny Unbound,” somewhat of a rarity, injected a breath of life into the crowd. Stretching to nearly nine minutes, this version of “Destiny” is longer than all in recent memory, but it was clear the band hadn’t practiced it much prior. “Ocelot” slowly turned into a jam that featured Anastasio’s slinky fretwork, built up to a peak rife with tension. A little bit of his old school bravado from the mid-1990s was on display, dancing runs of notes up and down with little abandoned. While some fans are growing a bit weary of The Garden, Phish doesn’t appear to be among them. Launching into the set closing “Walls Of The Cave,” Phish was set to send us all to the restrooms and beer lines with a little extra pep in our steps. Anastasio had a little trouble with the intro, but he was pushed by excellent drum work by Jon Fishman, who was quietly the most important piece of the band in the set. With his extra effort rubbing off on Anastasio, Phish set “WotC” into orbit with a frenetic finish, capped off by incredible lighting from Chris Kuroda, who has incorporated seemingly every house light in the building with his rig to make for quite a stunning visual component. The tone was immediately set when the first strums of “Sand” echoed through the sold out Garden. Anastasio quickly made use of his new toys on his completely redesigned guitar rig. Designed by Custom Audio Electronics, the set features new cabinets and a wide array of new options for Anastasio to incorporate. With the “Chalk Dust Torture” that followed, the band unleashed a jam that quickly became the highlight of the night. After the typical song portion, Anastasio bullied his way into a quiet jam that really felt forced and out of place. It seemed as if they simply decided they’re going to launch a completely separate segment, which really should be titled “Chalk Dust Torture->Jam” on the official setlist. That was quickly forgotten, as the quiet melodies bled into an Allman Brothers-sounding jam. Gordon and McConnell continued forcing Anastasio to enter new territories before dissolving into what can only be described as a siren-sounding jam. The execution of the segue into “Ghost” was as smooth as it gets. Almost contrary to the jam before it, this “Ghost” was led in force by the rhythm section. Gordon and Fishman landed on a smooth groove, to which McConnell responded with wavy synth runs to give the jam a dreamy finish. “Backwards Down The Number Line” may not be everyone’s favorite song, but no one can argue that it’s about as fun of a Phish song as there is. The previous 41 minutes was Phish showing us that nothing gets stale with this band. The following eight minutes was them telling the crowd how it’s as important to the show as the band is. When Anastasio sang the closing “you decide what it contains” lyric, the people on the Chase Bridge went into pure bliss. A very quick “Simple” gave way to the drums of “Split Open And Melt.” This “Melt” was the perfect cap to a show that took a left at every right hand turn. The middle segment was eerie, haunting and quite strange. 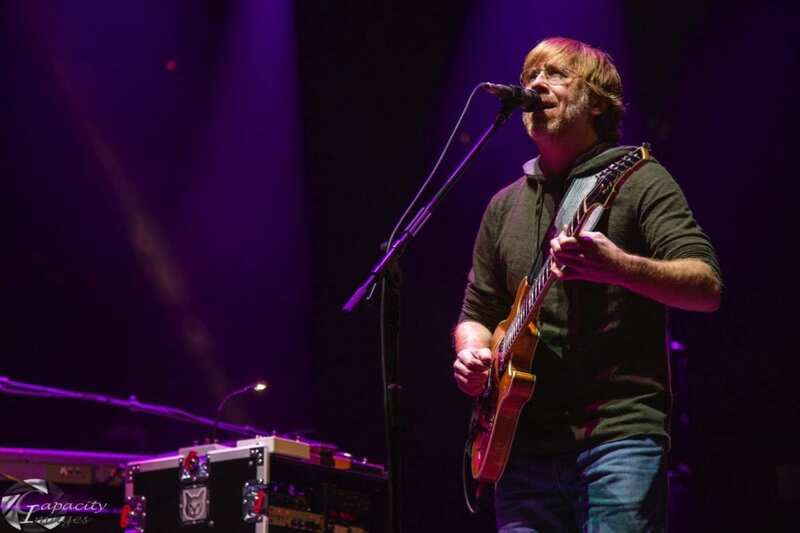 It was a dissolution into some ambient work by McConnell and Gordon, before Anastasio brought the song — and set — to a close. It was the most improv heavy “Melt” since the SPAC, 2013 version. For the encore, that bravado of Anastasio resurfaced. “Julius” may have been about the only predictable part of the show, but it gave Anastasio one more chance to show he’s most exciting and innovative guitarist in rock and roll today. The rocking finish was coupled with Kuroda lighting the Garden in some of the most impressive ways of his career, and that’s saying something. Tonight Phish goes for No. 16 at the Garden. If the first two nights are foreshadowing tonight, we are in for another gem.